'Dr Rajan is often preachy with commandments aimed at nobody in particular,' complains M S Sriram. Raghuram G Rajan when he was the governor of the Reserve Bank of India was often accused of delivering speeches that were beyond the remit of his office of managing the country's financial and monetary system. It was, however, a pleasure to read those speeches because he raised interesting questions. This put Dr Rajan more in the realm of a public intellectual rather than an economist. Each of those were standalone speeches, thoughtful and specific to an occasion and context. They were collected in his previous book I Do what I Do. The present book -- The Third Pillar -- continues on similar lines. 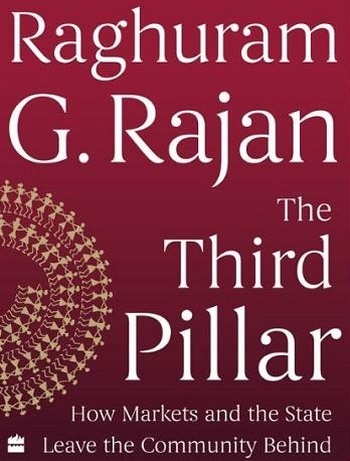 This book is an attempt by Dr Rajan to pick up one theme and elaborate on it. He moves beyond markets and the State and focusses on the community, its role and its centrality. We are currently looking at the excesses of markets; the redefinition of the role of the State; and increasing polarisation of wealth. In this context it is crucial that someone of Dr Rajan's stature (that he is from Chicago is not lost on us) reiterates that the raison détre of both the State and the Markets -- is actually people -- the larger community. This thought is welcome. Dr Rajan has been a voice of reason amidst irrational exuberance. Therefore, it is not surprising that he is talking about the community and community-based systems. While acknowledging that the context is appropriate and the author is the right person to talk about the issues, however, the book is a let-down. It is well-narrated and has most of the arguments. Unfortunately, it is neither specific nor does it have a strong framework. 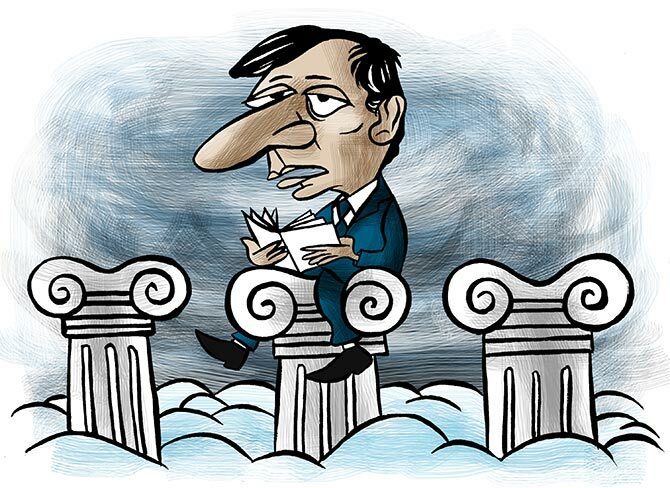 Dr Rajan is often preachy with commandments aimed at nobody in particular. This is very disappointing. That Dr Rajan chose to set the tone of the book in explaining and talking down to the reader rather than analyse and engage with the reader is intriguing. The book also has an unnecessarily large historic canvas where Dr Rajan explains the evolution of the modern state and the modern market system. That was unnecessary for the arguments he was making about the communities. His basic thesis is that there was a historical trajectory on how the State and markets have evolved and now they seem to be working as an end in themselves and this needs to be rebalanced. He neither contests the State nor the markets through a counter-narrative that restricts their overreach. Instead, he broadly advocates self-restraint for State and Markets; and advocates that the community take charge before it is trampled by these behemoths. Self-restraint is an oxymoron. And there needs to be a framework for taking charge. It would have been brilliant if Dr Rajan had used the frameworks of a. decentralised governance structures and b. active civic society engagement as an enduring argument to frame his thesis. He uses those structures episodically, brings in anecdotal evidence to make a point but does not frame it tightly. As I was reading the book I wondered if Dr Rajan was moving towards a Gandhian argument of localisation of production and governance systems. He tends to take the argument in that direction, but is suddenly reminded that industrialisation has grown so big that it could be an infeasible case. How much is too much and how weak is too weak is a question we need to engage with. Who is the 'we' in the above statement? The problem with the book is that all the arguments are laid out in the same tone -- neither here nor there. If only Dr Rajan had used Gandhi's Hind Swaraj as a base document and engaged with its arguments in the current context, it would have given a brilliant framework, since Gandhi had the community at the core. He could have glossed over some of the arguments that may not be relevant to cu­rrent times, but that framework would have best suited for Dr Rajan to make a more cogent argument. Alas, this is a book of good intention, great thoughts, lost in a preachy style. M S Sriram is a faculty member at the Centre for Public Policy, Indian Institute of Management-Bangalore. A rockstar in a sanskari world!